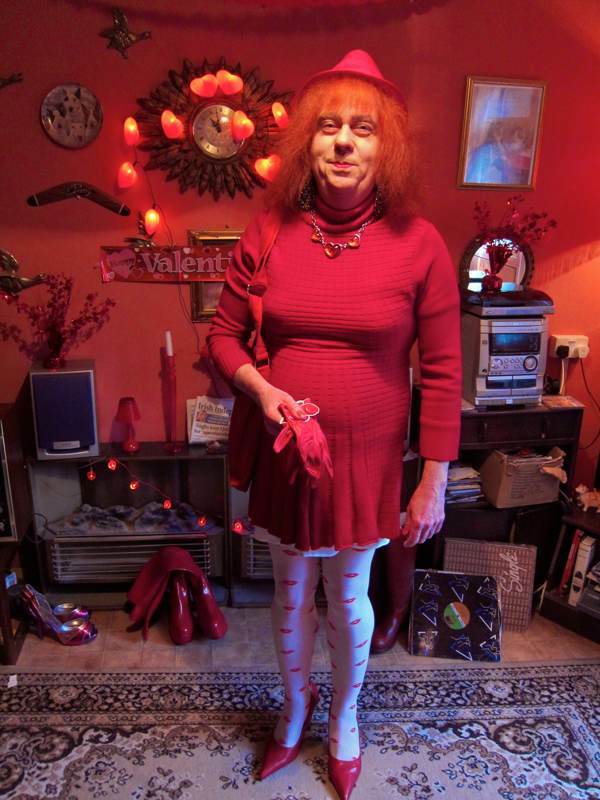 Viscountess Boudica of Bethnal Green confessed to me that she has never received a Valentine in her entire life and yet, in spite of this unfortunate example of the random injustice of existence, her faith in the future remains undiminished. Taking a break from her busy filming schedule, the Viscountess granted me a brief audience this week to reveal her intimate thoughts upon the most romantic day of the year and permit me to take these rare photographs that reveal a candid glimpse into the private life of one of the East End’s most fascinating characters. Viscountess, you look lovely in red. Are those your knickers? Out of all the fascinating people I’ve “met” through Spitalfields Life, there’s none I’d rather meet in real life! Viscountess, you have such a vibrant spirit shining from your face in every photo. Happy Valentines from Canada! I feel I personally have gotten to know you via the Gentle Author. Viscountess, you are the Goddess of Love. Happy Valentine’s Day. You are our neighbour and we love your colourful attire….You brighten people’s lives. 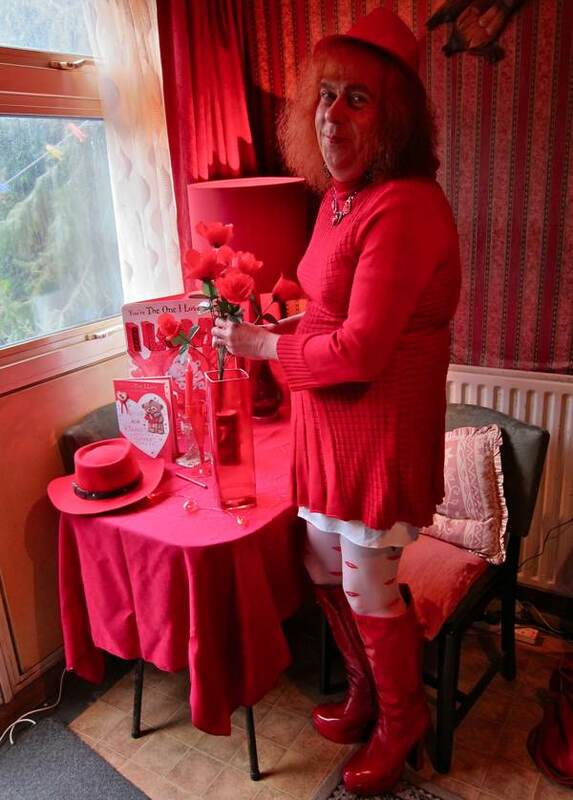 Viscountess, your red boots are the best! Nice legs, too. Happy Valentine’s Day from Long Beach, California. I am a fan of both you, and the Gentle Author . 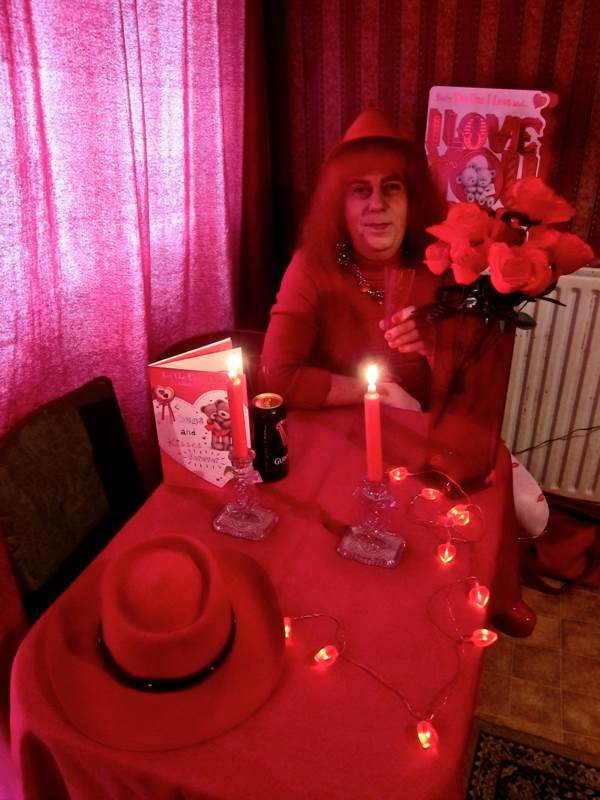 Dear Lady Boudica, I think I may love your Valentine’s flat more than your Christmas flat, if that’s possible! Thank you for the glimpse into your romantic abode. Remember that these days we also refer to Valentine’s Day as Galentine’s Day or Palentine’s Day. No one has to be excluded. You are beautiful. Happy Day. 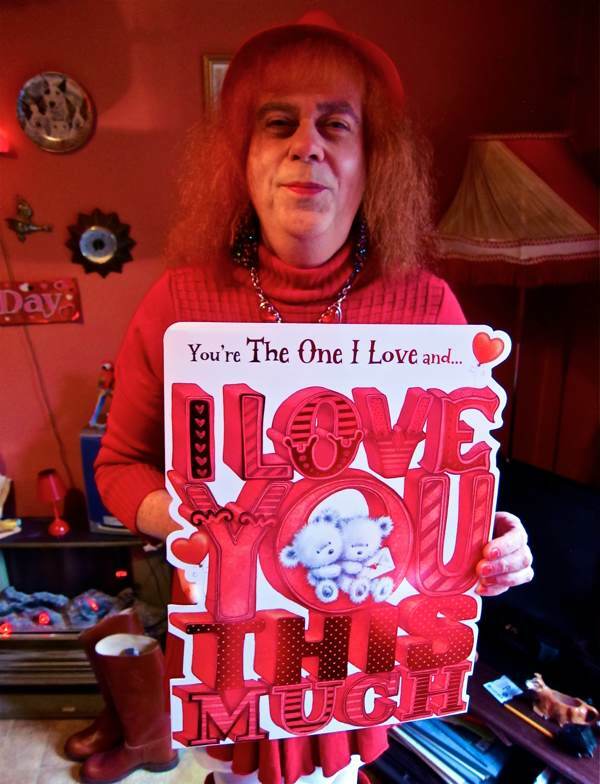 Happy Valentines Day to you but I’m a woman! Nevertheless I hope you find someone who will share your day with you! Without hope we are nothing. Happy Valentines, Viscountess. Happy Valentine’s Day Viscountess! You deserve some love. 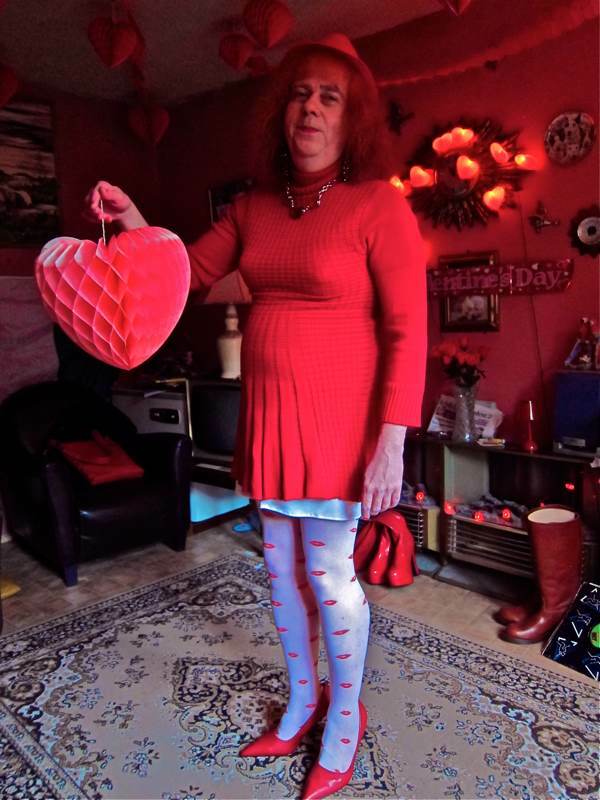 You have fabulous legs and I ‘heart’ those tights! Happy Valentines Day Viscountess. You are a shining light in what can sometimes be a dull world. The world needs more people like Viscountess Boudica. Happy Valentines. p.s. I LOVE your tights! Very chic. 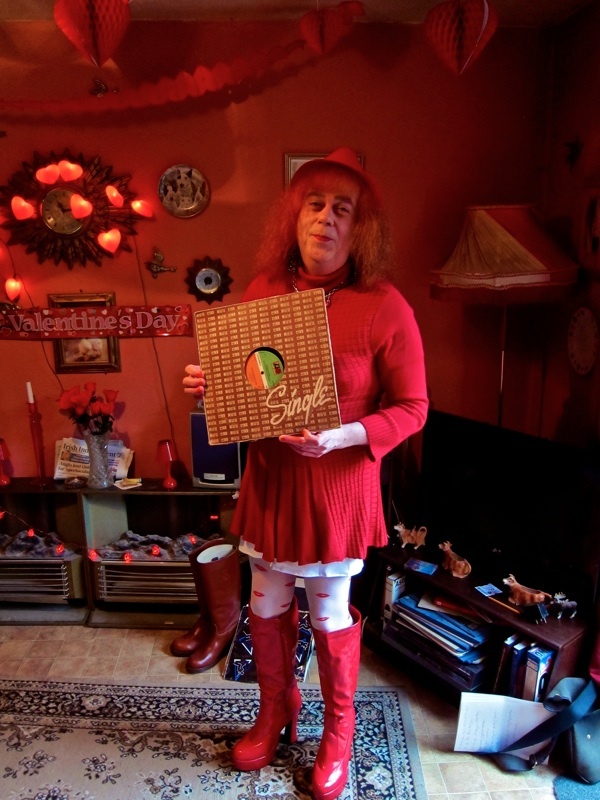 In our hearts we send you a huge bunch of red roses and an enormous heart-shaped box of chocolates. Viscountess, your tights alone have brightened my day! 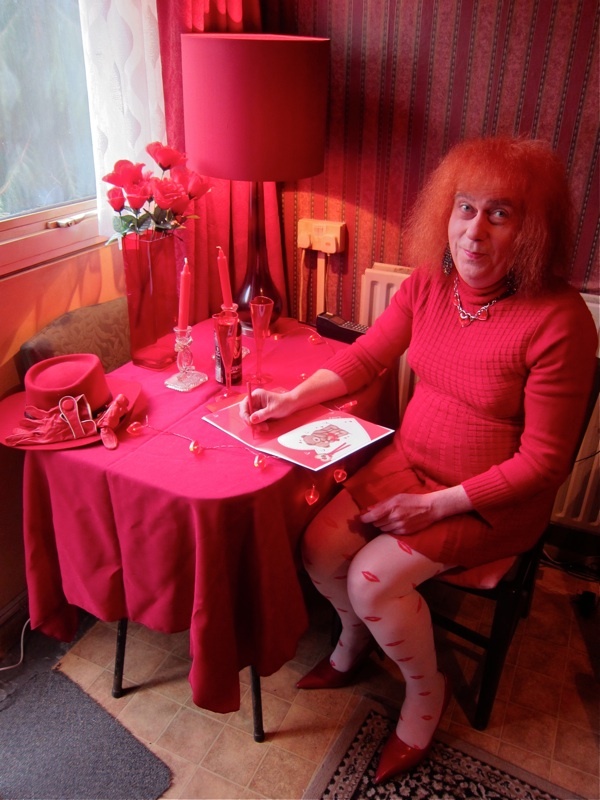 Happy Valentine’s Day…you bewitching creature…Spoil yourself. I’m so sad to hear no one has sent the Viscountess a valentines! You truly deserve one. 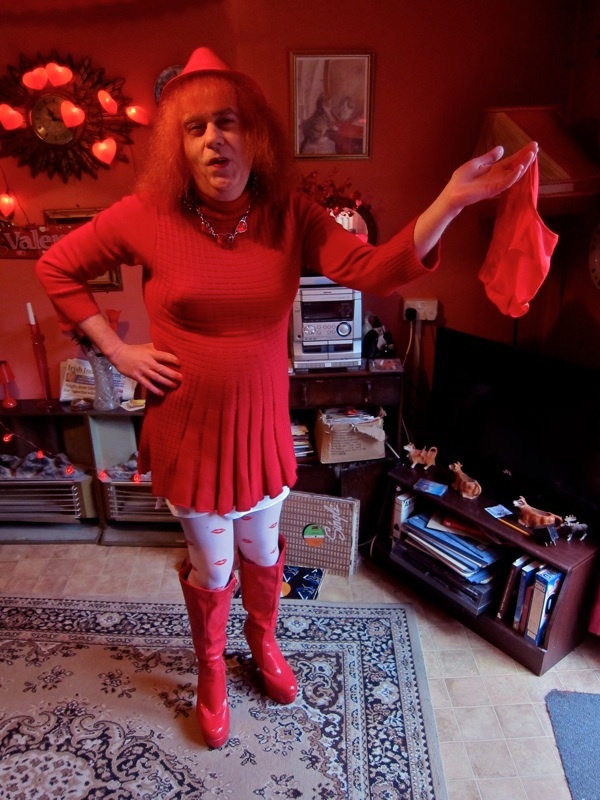 You look stunning in red! Hope this year surprises you! Something so good and beautiful should be shared around – you would be wasted on just one. Happy Valentine’s Day Viscountess! Have a fun day – maybe a glass of rosé later under those fab decorations ? Enjoy. Greetings from flooded Worcestershire you and the GA brightened our day! The world needs people like you have a lovely day! And fill you with love. Here’s a valentine note from Oregon, Wisconsin and I’ll bet you didn’t even know there was such a place. If I could enclose a dozen (or more) bright red roses with it I sure would. But hopefully someone else will do it for me. Viscoutess, you’ve lit up an otherwise drab and dreary February morning for me. You have made me smile. It’s been a sad week. My cat died on Wednesday and I feel raw. TGA and you have cheered me up. 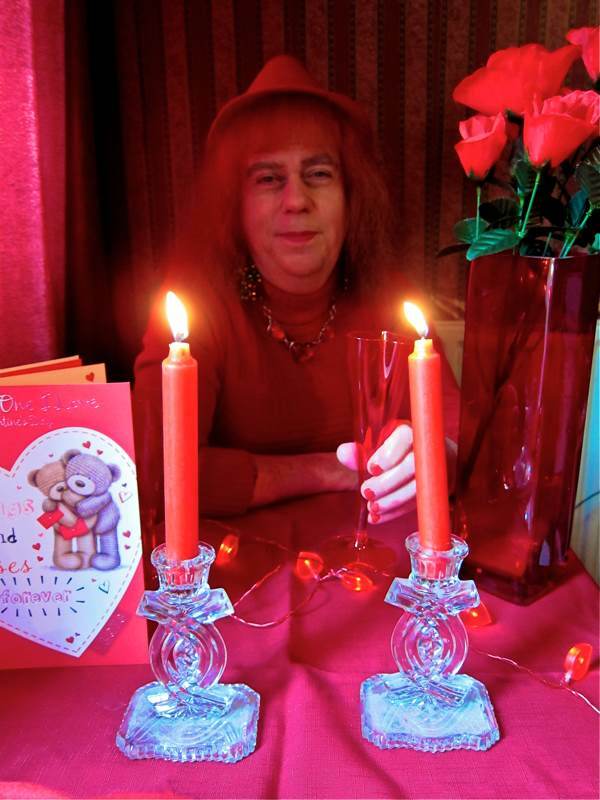 Happy Valentine’s Day Viscountess Boudica! Wishing I had those lipstick tights which you look terrific in. Dear Viscountess, you make the world a better place, Happy Valentines Day to you, with roses and chocolates. Wish you could be my Mumsie too!! Valentine Greetings from the States. You know how to live! Rock on. Another holiday greeting to you from Wisconsin, though this one comes from Hudson. I’ve only received one Valentine, and he was absolute rubbish and caused so much pain, which took a few years of therapy to cure. I’ve always disliked this day, but I have finally realized that I don’t want a significant other by my side. I have such a full life of friends that I feel the love and freely give it to those for whom I care. I am grateful for the quiet solitude I have at home, and although I choose to walk this path in life without a significant other, I am never lonely. May you feel the love and joy on every day, and not just on this one. You are a truly lovely and inspiring woman, and you are loved and cared for by many. Peace and love to you! A most HAPPY VALENTINE’s DAY greeting from Greenville, South Carolina, U.S.A. !!! The symbol of the day is the heart, and we readers all know what a big one you have. May your forgiving, loving. generous, fanciful nature spread to those lacking same!!!! Thank you for living with an open heart that overflows with joy; you are inspiration. Roses are red, violets are blue, Boudicca my pet, there’s only you. Happy Valentine’s Day from an admirer in San Francisco who sincerely appreciates your good cheer. Love and kisses from Seattle, Washinton, in the good old US of A! Happy Valentine’s Day, Viscountess. You look lovely in your Valentine’s finery. Best wishes that you will find that special someone! A most happy and bounteous Valentine from your great admirer in New York City, to whom you bring continual joy! you speak to me from the soul! 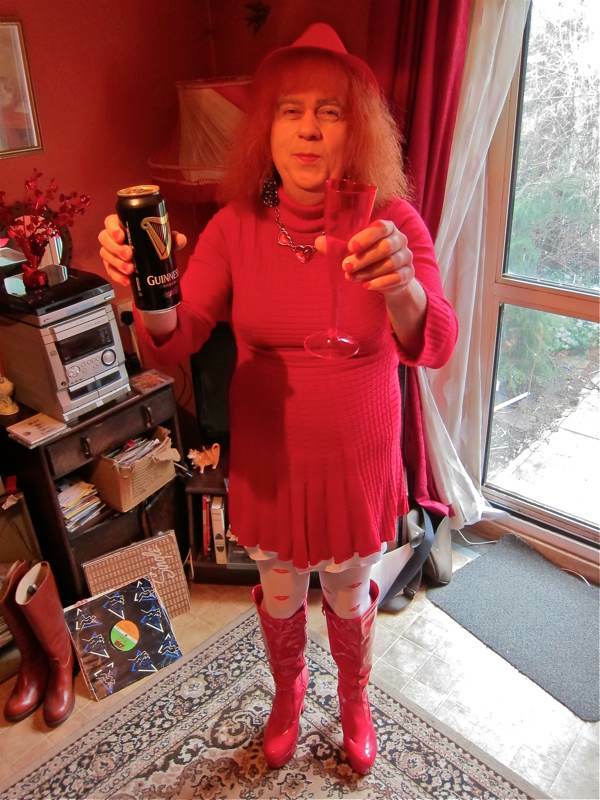 Viscountess Boudica- Happy happy happy St. Valentine’s Day! You are the perfect ending to my perfect day – Sending much love from across the pond! You’ve warmed so many people’s hearts Boudica on this chill Winter’s day! A Valentine’s Day to remember forever. Major, major, major Happy Valentine’s Day Weekend Month! I wish you nothing but magic and lovely things, Viscountess Boudica! Happy belated Valentine’s Day, Viscountess! You are marvelous! Belated Valentines day wishes to you. Next time I see you in Bethnal Green, I’ll say hello. Fabulous, uplifting and inspirational. Wishing you Valentine’s happiness all year round, not just for one day.